Enjoy the exceptional custom quality and time-saving of our line of pre-cut mat design. 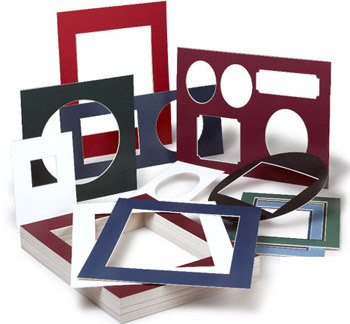 Our hand-cut, beveled mattes can be utilized for non-conservation framing of: posters, fine art prints, craft projects, and amateur photography, and professional photos. Double mattes, triple mattes, mattes with multiple cutouts, oval cutouts, circular cutouts, custom cutouts, no job is too small for us to complete and no matte is too complex for us to create. We have very reasonable prices on quality products with small minimums and a quick turn around. Leave the mat cutting to us!